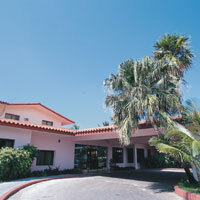 Hotel Oasis Tennis Centre at bookallcuba.com, hotels in Varadero, Cuba hotels together with car rentals. Hotel Oasis Tennis Centre , Varadero, Cuba. Vía Blanca Km 130, Varadero, Provincia de Matanzas, Cuba. It is located right by the beach, 13 kms from "Juan Gualberto Gómez" Varadero International Airport and five kms away from downtown Varadero. 147 rooms with air conditioning, private bath and satellite TV. The hotel also has a restaurant, 3 bars, a pizzeria, boutique, pool, 2 tennis courts with night lighting, motorcycle rental services, Jacuzzi for six people, gym, sauna and massage rooms, foreign exchange services, safety deposit box, tourism office, inbound and outbound transfer services, parking and taxi services.